It was as far back as 2010 that I presented the Merlin. 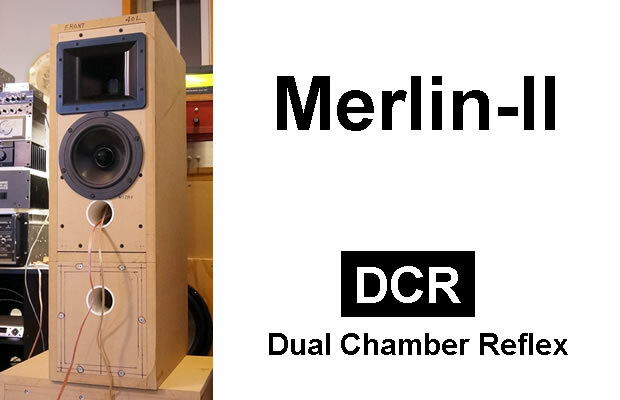 The Merlin is an interesting design in that it is a DCR (a Dual Chamber Reflex). Internally, there are two chambers with three tuning ports altogether. The net result is you not only get the low bass as in a normal bass reflex, but the other chamber produces a wonderful mid-bass. Since I’m in the process of testing horns, it would be a good opportunity to test out the Merlin again. This time round, instead of the Seas 27TDFC dome tweeter, I will replace it with a Pyle PH565/PDS182 combo and time align it with the Dayton RS180S midwoofer. Fig 1 shows the summed response of the Merlin-II without time alignment. 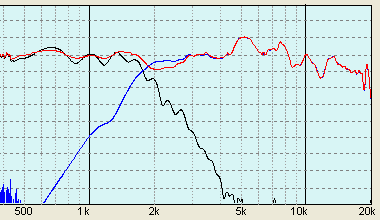 Electronic crossover was set at 2kHz (24dB/oct). No CDEQ was used. From the plot, we can see there’s strong cancellation to the right of the crossover frequency. Fig 2 is the summed response with the Pyle PDS182 wired in reverse phase. Now, cancellation is seen on the left of the crossover frequency. With the compression driver still wired in reverse phase, a delay was added to the RS180S until a deep notch appears (Fig 3). This is an indication that the two drivers are time-aligned. In Fig 4, the compression driver is re-wired back to normal phase. The summed response (Red trace), shows no cancellation on either side of the crossover frequency. (Fig 5) Time-Aligned Frequency Response of Merlin-II. Microphone at 1 meter tweeter axis, 5 msec Gating, No Smoothing. Fig 5 shows the expanded view of the Merlin-II response. Disregard measurement below 500Hz as they are out of the gating range. The missing chunk of frequencies from 100Hz – 200Hz is due to floor bounce. Nothing to worry about. What is interesting is from 50Hz – 100Hz. This is without any electronic bass boost. You won’t get this amount of bass with a 7″ midwoofer in a normal bass reflex. This is where the Dual Chamber design shines. As I was hoping for, the slight grittiness in the highs vanished when the drivers are time aligned. Sibilance sounds much smoother too. The Merlin-II can’t get better than this. And the best part, it’s only a two way. No subwoofers needed.